Bark mulch, trees and bushes may be required by city standards, but where is one to step? What were they thinking? It’s no big deal, but that’s what I was wondering when I looked at this bit of landscaping in the Albany Fred Meyer parking lot on Wednesday afternoon. Landscaping is a good idea from the standpoint of looks, and for catching runoff, and Albany’s Development Code requires it. But maybe somebody should consider how practical some of these elements are for people getting in and out of cars. The code has minimum standards for parking lots. One is that landscaping cover at least 5 percent of the lot, and that areas of more than 100 spaces be divided into clusters separated by landscape strips. In addition there must be bays of no more than 12 spaces, and at each end of the bay, there must be a curbed planter at least 5 feet wide. The planters must have trees, decorative ground cover and shrubs. All fine and good. But what good is it to have a planter next to a space if you park there and somebody wants to get in or out of the car? Step on the plantings? Trample the shrubs? 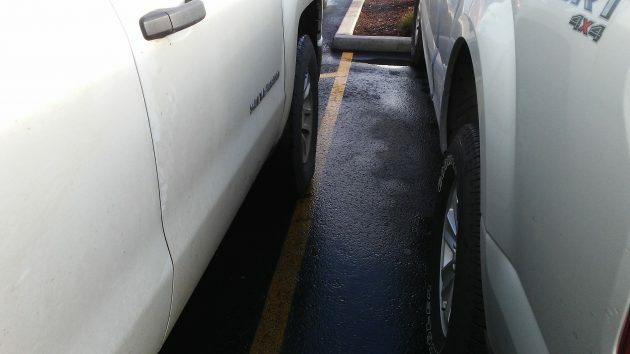 Maybe wider spaces would have helped the guy on the left. I love the parking spaces at Costco! They are double lined, making the spaces wider and parking a breeze. It also lessens the worry for door dings. Wish all parking lot designers would take car size (and peoples’ sizes) into consideration and the need to actually open your car door more than a foot to get things/people in an out of the car. Following a small “misstep” at the new FM parking lot, my insurance agent told me the new configuration there is a nightmare for them. 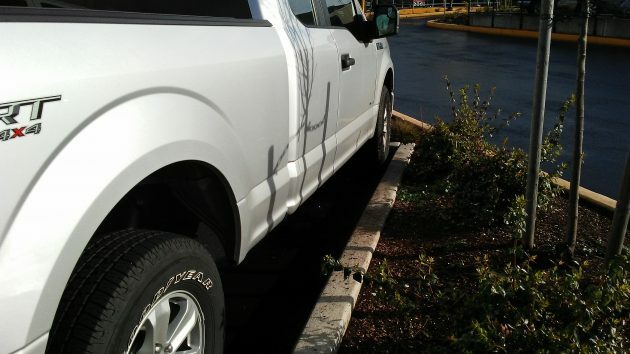 Apparently the small spaces and high density have created a spike in parking lot incidents. They may have increased the space count dramatically, but the design was badly done. The corporate interests who own and operate Fred Meyer don’t care if your car door gets dinged by pick-up driving boors, their monstrous belching beasts swallowing acreage whole. The corporate owners only care about packing more people into their store. If you gotta step into ankle-busting brambles that slash at your flesh when exiting your vehicle, you can thank the regulators. It seems business and government have joined forces to make certain your shopping experience is unpleasant. Enjoy the good feeling tRump fans. It won’t last. Back to the HH story, I’m having trouble picture where the “lost” entrance off Santiam is? Field trip for discovery!! Referring to the entrance of old Blockbuster store? So now you have your environmental regulations AND no job cuts? Where’s the problem? States operate on far different ground rules than the fed. And your ridicule of Trump’s name does not improve your argument. Rather is shows your weak rhetorical ability. 2. Threatening to strip citizenship from opponents. 3. Attacking free speech rights. 4. Claiming you are the ONLY ONE to fix “it”. 5. Blaming foreigners & non-whites for all the ills. Whether I refer to Trump as Trump, President-elect Trump or tRump, it does little to negate the red, flashing warning signs. I have more examples if you desire. Plus, if you follow the link below, you will see a letter from Carrier to their employees stating they are still cutting 600+ jobs. The devil really is in the details with Trump. I know this is not an option for everyone, but as I hate door dings, I just park out much further at FM or COSTCO or Heritage Mall as well. I do believe the parking lot at FM is fine now. If one has a passenger who would have to step into a shrub, how difficult is it to just choose another lot rather than complaining? Meanwhile, motorcyclists or single drivers benefit from the extra space. Frankly, if I drove a long-bed-extended-cab PU, I’d find another spot to the south. Lots of spaces and just plain space. Leave the curbed ones for cycles and minicars.